The 1950s saw a burst of construction throughout Chicagoland, and the moneyed, historicist-drenched north shore was no exception. 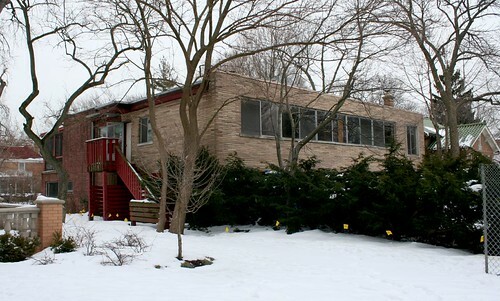 1952 – One of the north shore’s oldest post-War modernist houses is this split level. It stands in a virtual forest today, largely obscured by trees and bushes even in the dead of winter, but its simplicity of style and contemporary massing are evident nonetheless. 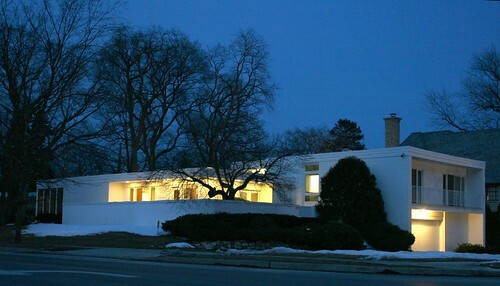 1957 – This house must have been shockingly minimalist among all the elaborate bungalows and NeoClassical mansions lining Sheridan Road. Its incredibly thin and flat roof and utter lack of ornament still stand as a stark contrast to the houses around it, even its ranch house contemporaries. The pattern of yellow and slate blue brick colors is wholly unique. 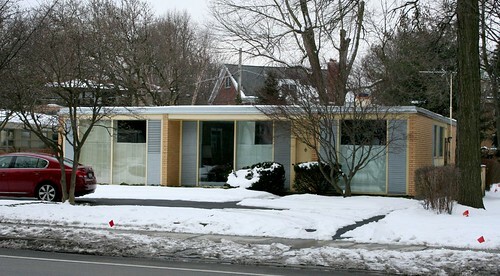 1957 – A few miles south, a pair of MidCentury houses went up across the street from the famed Baha’i House of Worship. 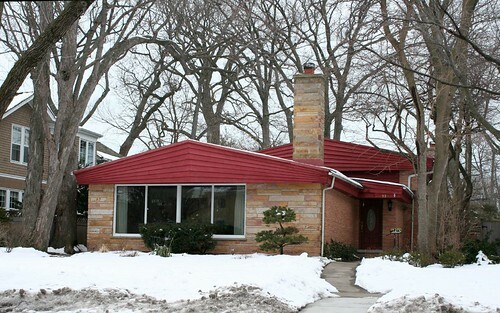 This one, the senior by one year, has many classic Chicago MidCentury elements – two tones of horizontal flagstone, the banded facia lining the flat roof, and stylized geometric porch railings. 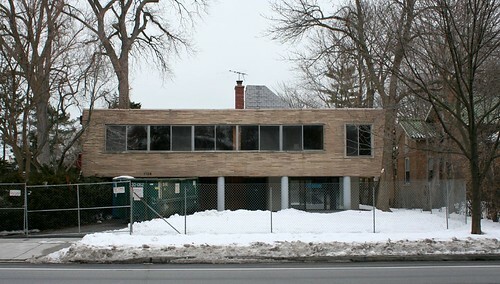 1959 – The neighbor to the north is predominantly built of brick, now covered in white paint (not original, I’m guessing). It has a more volumetric massing. 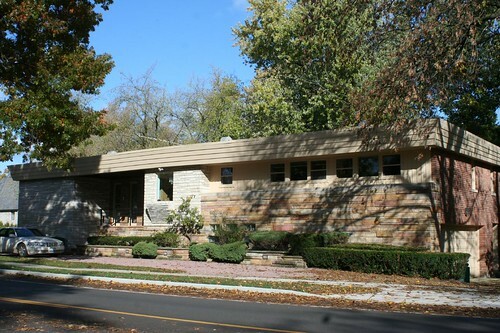 1959 – A mile or so up the road, this ranch house hews more closely to the standard Chicago MidCentury model. Flagstone walls, a broad picture window in front, and gently pitched roofs are all typical of the more mass-produced builder houses from the same era. The angle-intensive red pediments also draw on a common Chicago builder element, but having them repeated in triplicate really gives this little house some eye-catching pop. 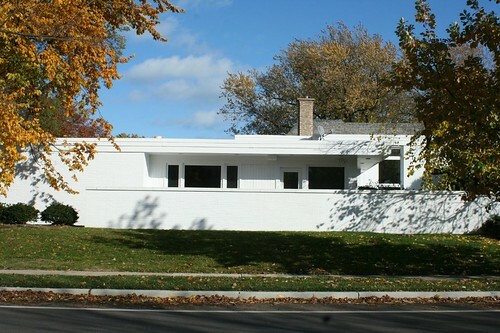 1958 – Well, someone had paid a visit to Villa Savoye, and here attempted to translate that iconic house into Chicago terms. The results are interesting but definitely awkward. That flagstone, for example, was never meant to float through the air like like that. This poor house is also crammed into a fairly narrow lot, leaving it no room to breath, nor any room to be viewed as a singular object. The architect knew it, too; the sides are faced with cheaper brick, giving the house’s elevations a distinctly split personality. The house has sat vacant for a while, and I nearly had a heart attack the morning I saw a construction fence going up around the lot. 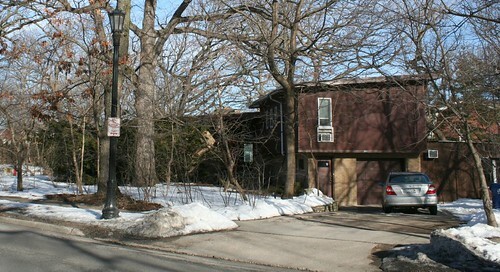 The permits, however, seem to be for renovation rather than demolition. Using two types of bricks in construction is found everywhere in Chicago homes. 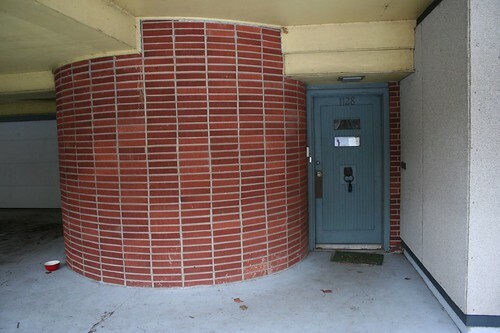 The front facade used "face brick" and the sides/back used "common brick". This allowed for cheaper materials to be used on the sides of the house that "no one saw" due to close proximity to neighboring houses. They don't make "common brick" anymore. The little yellow house doesn't use the ornate/common brick strategy; the yellow brick wraps the sides as well. And I've never seen a yellow brick building anywhere in Chicago. Anyway, on closer examination, I was wrong – there's only one brick color. The blue sections are some sort of slatted screen. I always thought the yellow and blue house was Keck & Keck, but I haven't found it listed anywhere.